Mei Zhong Yang Style Taijiquan Association, U.S.A. Founded in Atlanta, Georgia, in 1997, Mei Zhong Yang Style Taijiquan Association, U.S.A. promotes Yang Style Taijiquan as it is taught by Fifth Generation Yang Style Master Cui Zhongsan. 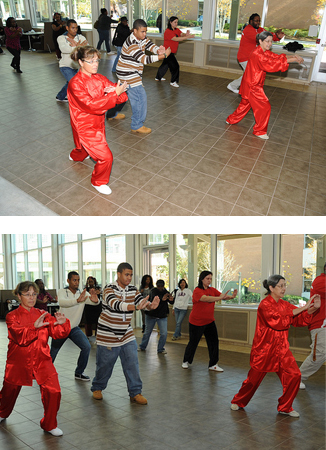 We learn taijiquan as a martial art, knowing that mastery of the art requires years of practice. We also recognize that from the first lesson, everyone can benefit from this remarkable discipline, even if they do not wish to become martial arts masters. In 2007, we introduced Qi Gong (cultivating breath-energy) classes into our curriculum. These classes have become an excellent "gateway" to taiji for many students who wanted to build their stamina and strength before embarking on a taiji program. Other students have discovered that focusing solely on our Qi Gong system satisfies their goals for stress reduction and health benefits. Mei Zhong students have individual goals that vary widely. Their goals range from "being able to relax" to "becoming an international taiji champion" to "gaining true mastery of taiji skills." Mei Zhong is a traditional school, welcoming anyone who wishes to explore this fascinating and challenging art. I thought Master Cui looked too young to be a real master. Then he came to our class! Wow!! !